You know how some people think summer break causes kids to forget everything they learned the previous school year? The same may be said of drivers: summer vacation may also cause drivers to forget their school-related traffic laws. With another school year starting, school buses will be running, beacons will be flashing, and kids will be walking to school again. Here’s a review guide to remind you of safe driving around elementary schools in Bellevue. 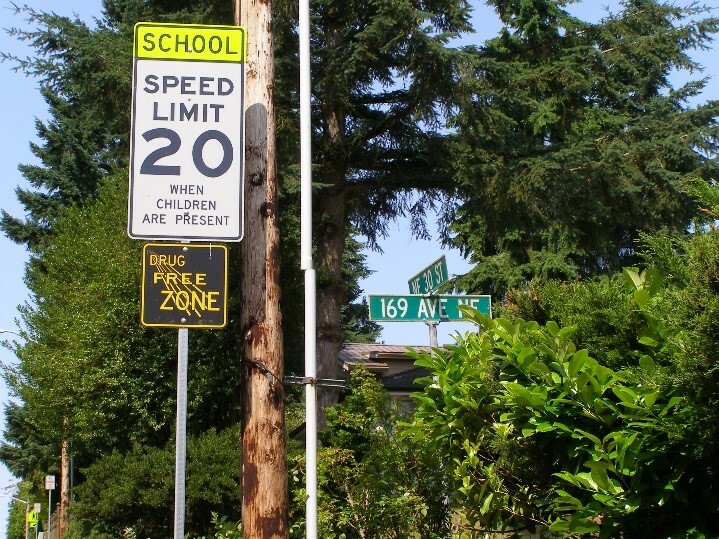 All elementary schools in Bellevue have established school zones, in which during certain hours of the day, the speed limit is reduced to 20 MPH and drivers should be extra cautious for children. Traffic tickets and fines are doubled in a school zone, so for the sake of the children (and your wallet), please drive safely. School zones follow a specific schedule, but for a basic understanding, remember school zones hours are in effect around the start and dismissal times during school days. 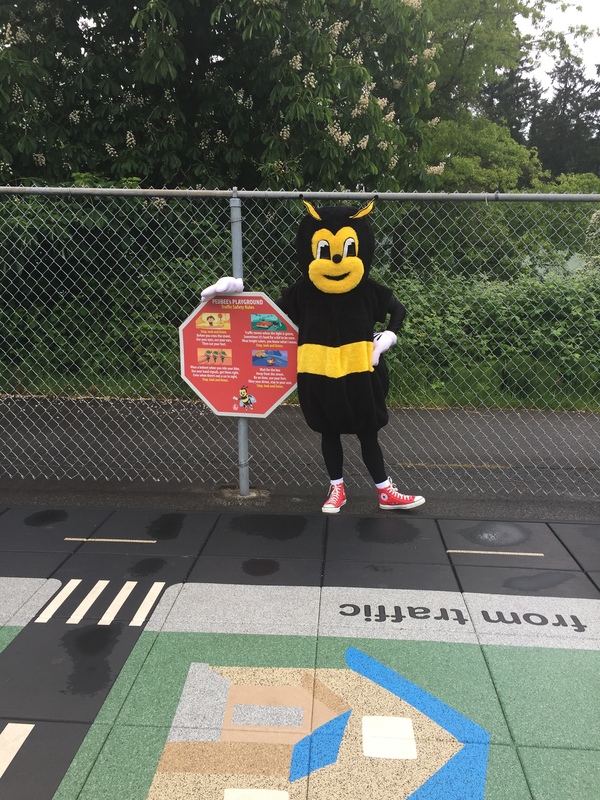 Signs are posted around elementary schools to remind drivers that they are within a school zone, and the majority of elementary schools have flashing beacons which blink during the exact school zone hours. Flashing beacons in effect outside Eastgate Elementary School. Flashing starts 30 minutes before until 10 minutes after arrival bell. Schools with breakfast program: Flashing starts 10 minutes before service. Flashing starts 10 minutes before until 30 minutes after dismissal bell. Do not flash during school holidays. 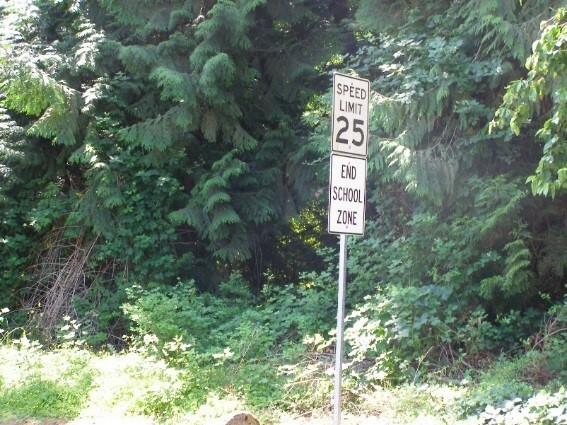 A sign indicating the end of a school zone. A school zone sign close by to Ardmore Elementary School. Although the sign does not have beacons, equivalent rules apply. Crosswalks are abundant around schools, so stay alert for kids walking and biking across them. Often, crosswalks will have adult and student crossing guards. A sign warning motorists of an approaching crosswalk, followed by a sign signifying the actual crosswalk. 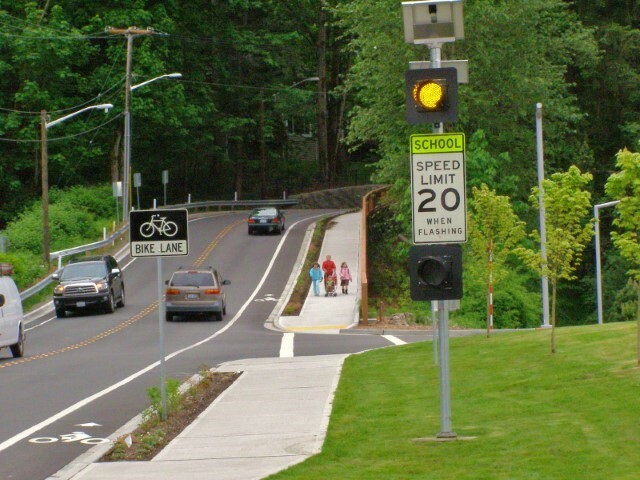 School crosswalks are identified by a different signing than standard crosswalks. The five-sided sign is used to warn approaching road users of a crossing where school children cross the roadway. A school crosswalk sign near Clyde Hill Elementary School. 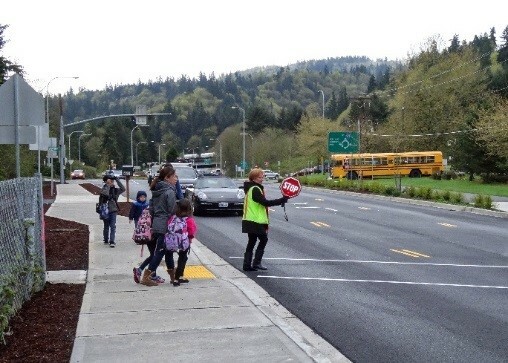 An adult crossing guard directing traffic across West Lake Sammamish Parkway to Sunset Elementary School. Student crossing guards working an intersection next to Newport Heights Elementary School. School buses will be back on the road and they have special rules compared to Metro buses. If you are going the same direction as the school bus, you have to stop when the bus’s stop sign is extended and the red flashing lights go off. Preceding yellow flashing lights will notify motorists the bus is about to stop. If you are driving in the opposite direction, you must stop if you are on a two-lane road, but not three or more. If the road is divided by a physical barrier, you do not have to stop if driving in the opposite direction. 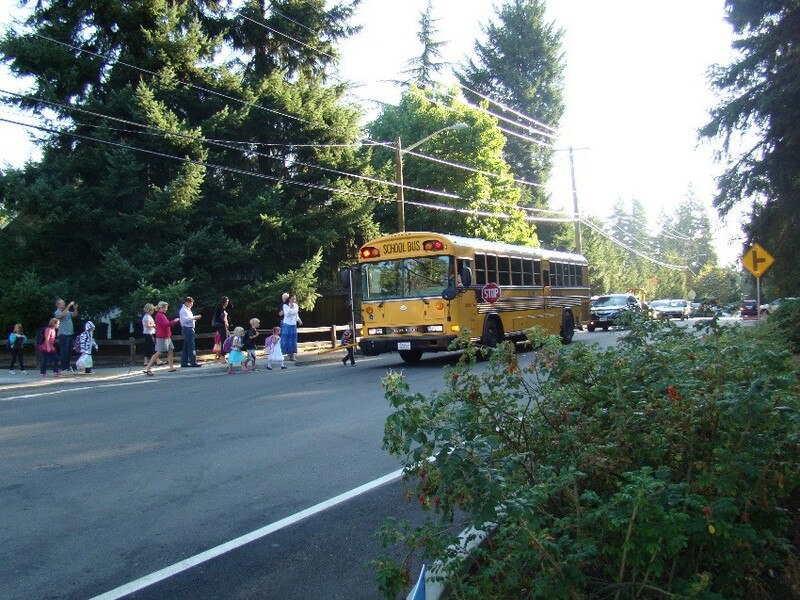 A school bus picking up Spiritridge Elementary School students. Since the road is only two lanes and not separated by a barrier, cars in both lanes must stop. 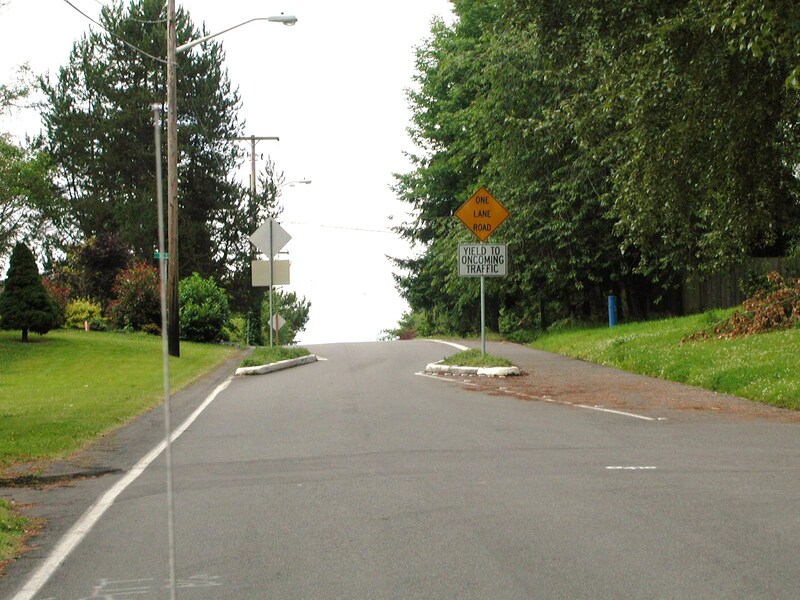 In 1906, a small town in New Jersey officially and successfully installed the first recorded speed bump. The town of Chatham used the ‘speed reducers’ to alert cars to pedestrians using crosswalks. On the day they were tested, hundreds of residents gathered around the bumps to watch the ‘machines’ drive across them. The bumps, which were 5 inches high and made of rock and clay, gave the first motorists to traverse them quite a rude surprise when his car shot up several feet. This solicited a loud cheer of approval from all those watching and proved that the speed bumps were in fact effective. We should all take a moment to thank modern suspension for being able to handle speed bumps a little better than Fords model A’s, C’s, and F’s. Today the term speed bump is often used to refer to a family of vertical deflection devices. 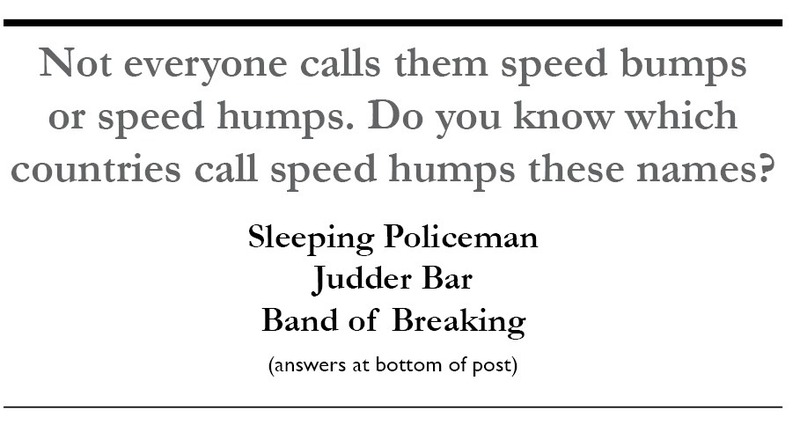 Within the family there are variations of the speed bump, a hump, and a cushion. Speed bumps are the most commonly used form of vertical deflection devices. Due to speed bumps height (3-4 inches) and their width (usually 1 foot), they are designed to slow vehicles down to about 5 mph, which makes them ideal for parking lots. The City of Bellevue does not install this type of device. Speed humps, originating in England, are more convenient for residential roads where the intent is to slow cars down to about 15-20 mph. They tend to rise up to about 3-4 inches but do so over a much broader distance. They are usually 12-22 feet in length and span both lanes. Speed humps were designed in the 1970’s as an alternative to speed bumps so that emergency response vehicles response time wouldn’t be as impacted when responding to an accident. 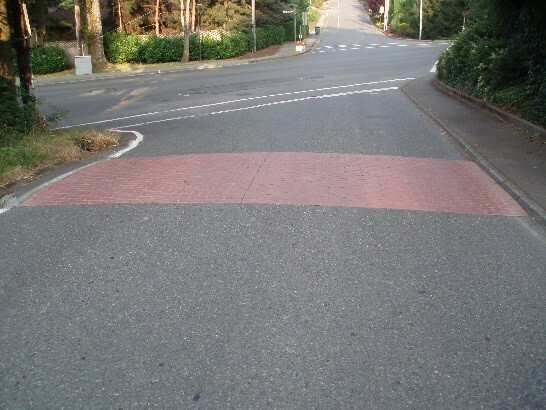 The City of Bellevue uses speed humps that are 22 feet in length on emergency response routes, used for raised crosswalks, in areas with transit routes, and on roadways have that have higher traffic volumes. 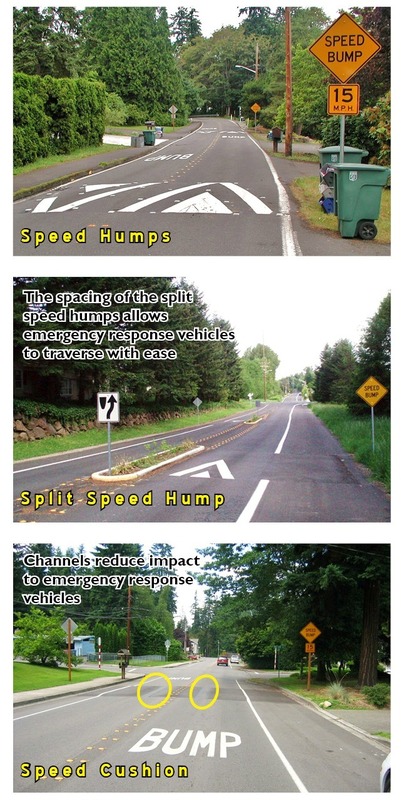 Wondering why speed humps are not labeled as speed humps (versus speed bumps) in the City of Bellevue? Well, it’s a commonly stolen sign. Bellevue also uses what is called a split speed hump. This is where the speed hump is split into two sections. Each section crosses the entire lane but they are placed several yards down the street from each other. This allows emergency response vehicles to navigate between them instead of over them. A speed cushion is similar to a speed hump but instead of being a single bar across all travel lanes it is cut into multiple sections. The middle section is six feet wide with one foot slots between the outer sections. This allows vehicles with wider axles such as emergency response vehicles to drive through the slots without having to slow down. 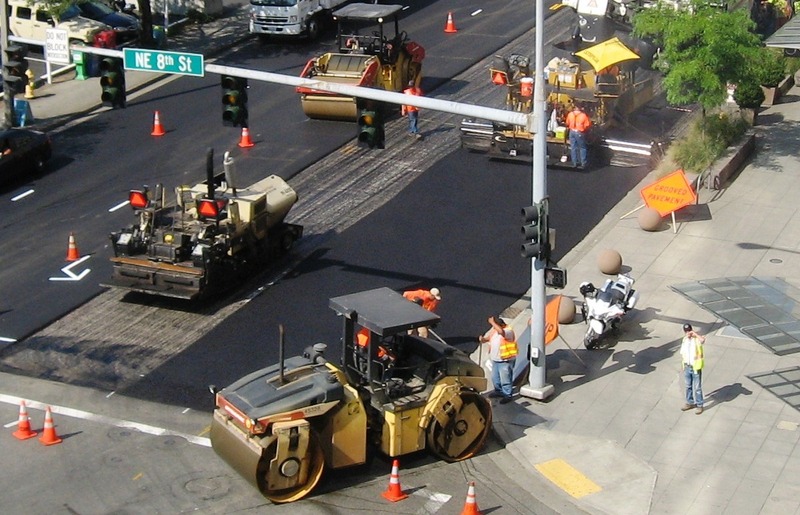 ‘Tis the season for construction projects and at the top of the list each summer is repaving projects. With more sun, longer days, and fewer cars on the roads, it’s prime time for construction crews to head out on many roads to repave and make repairs. The City of Bellevue will be attending to approximately 22 miles of Bellevue streets this summer. The video below gives an overview of the Streets Overlay program and how the grinding and overlay process works. The City of Bellevue has also put together a page dedicated to informing you of upcoming projects so you can be aware of whats happening. Remember, part of the paving process involves putting temporary rubber locators in the roadway to identify utility lids. Finally, there is a great animation and explanation of grinding/overlay over at Pavement Interactive. The website walks you through the different procedures that occur between the grinding off of the old asphalt and the placing of the new layer. The project team (the “Fab Five”) for the recently completed NE 8th St RRFB at Crossroads Park walks across the mid-block crosswalk. As the city grows, so does our transportation technology toolbox. In the past few years, the City of Bellevue Transportation Department has introduced new intelligent transportation systems such as flashing yellow arrows (FYA) and adaptive signal controls. While those technologies focus primarily on the motorist, new rectangular rapid flashing beacons (RRFB) are providing pedestrians with increased visibility at crosswalks where there are not otherwise signals (e.g. mid-block crosswalk). RRFBs are slowly rolling out to select locations in Bellevue. RRFBs are signals that are push-button initiated by the pedestrian that activate rectangular LED flashing lights above the roadway informing motorists that pedestrians are in the crosswalk. 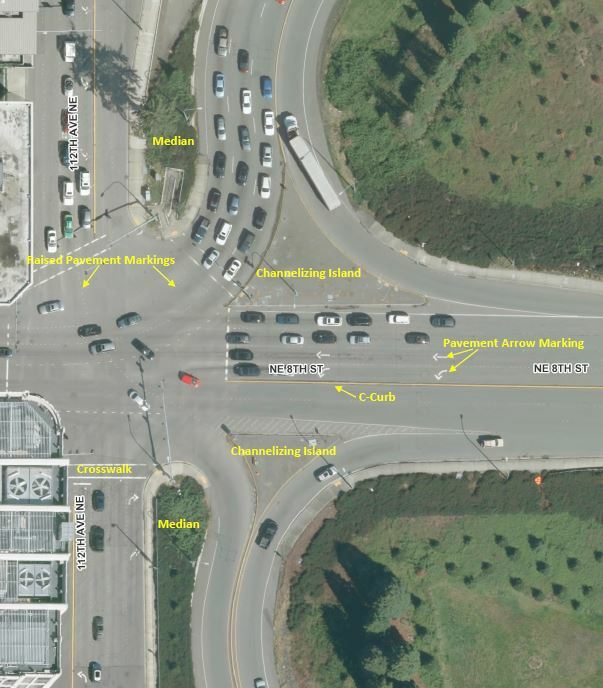 Unlike at signalized intersections, pedestrians won’t receive a “Walk” phase. As a result, you should still proceed cautiously across the street when traveling across roadways with traffic approaching. 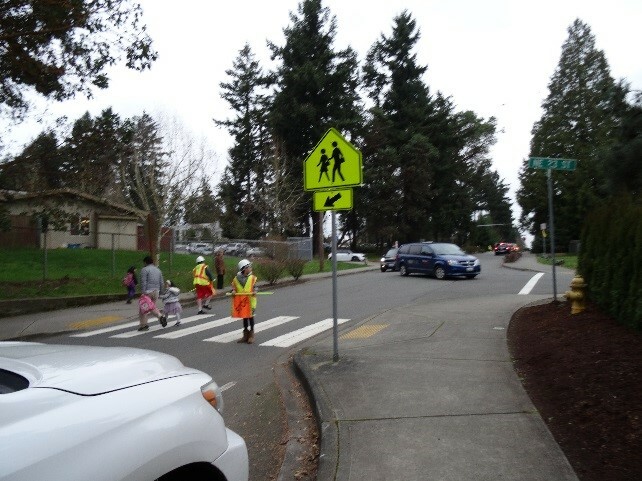 As a motorist, according to Washington state law you have a responsibility to watch for and allow pedestrians to cross the roadway, regardless of whether the pedestrian is at a marked or unmarked crosswalk at the intersection. RRFBs, when compared to traffic signals, are a lower-cost alternative and have been found to increase motorist compliance compared to other technologies. Federal studies indicate that RRFB’s irregular flashing patterns create higher driver yield rates to pedestrians than other the treatments; the flashing pattern is similar to flashers on emergency vehicles. RRFBs increase attention to mandated signage for mid-block crosswalks. In that way, they are an “above-and-beyond” measure intended to increase visibility for pedestrians trying to traverse busy roadways. While RRFB technology is relatively new to Bellevue, its use is becoming more commonplace with new locations being evaluated on a regular basis. However, much like the flashing yellow arrows, pedestrians and motorists will likely need some time getting accustomed to this new technology. As with any field, sometimes we transportation professionals can use jargon terms that you may have heard but are not that familiar with. To clarify these terms, we have been publishing a twice-weekly Twitter feature on @BvueTrans to define them. While 140 characters is great for some terms, sometimes we need a little extra room to explain a term here on Streets are for Everyone. Enter: channelization. This intersection in downtown Bellevue at NE 8th St and 112th Ave NE uses several different methods to channel traffic including medians, lane markings, curbing, islands and raised pavement markings. The purpose of these devices is to separate competing traffic flows. At this intersection channelizing islands funnel traffic turning right allowing traffic to move quickly through the intersection. This intersection includes pavement markings that decrease the angle at which cars are merging onto NE 8th St allowing them to merge more effectively at higher speeds. Raised pavement markings, accompanied with painted lane markings, guide moving traffic through this intersection. Raised pavement markers easily communicate with drivers where they should drive and alert drivers if they cross over by vibrating the vehicle. Crosswalk markings help both pedestrians and vehicles identify safe crossing areas. Though not shown above, bike lane markings are used to create delineated space for cyclists in the roadway. Sharrows are bike markings placed in the travel lane to identify where cyclists may be traveling in the roadway. If you missed our previous #trafficlingoAtoZ tweets, check them out below. 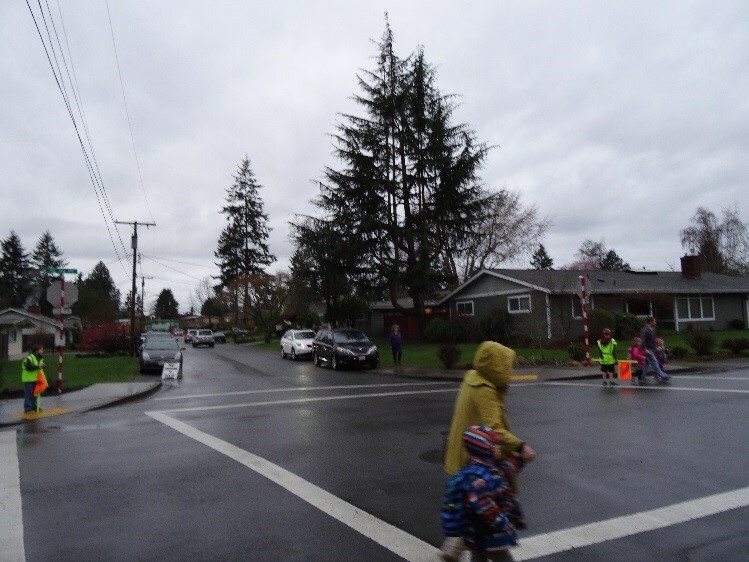 As the New Year begins, Neighborhood Traffic Safety Services will be conducting several new traffic studies that measure vehicle speed and volume in Bellevue’s neighborhoods. These studies are an integral component in how we analyze a street to determine traffic conditions. The presence of two tubes across the roadway indicates that both speed and volumes are being recorded. If only one tube is present, that’s an indication that only volumes are being recorded. With holiday travel behind us and school back in session, now is a great time to study our neighborhood streets for representative speeds/volumes. Do we send a staff member in the field to guess how fast cars are going? Of course not (our perception of vehicle speeds is usually very different from reality), we hire a consultant or use in-house staff to set a series of pneumatic tubes across the roadway that accurately and reliably capture both speed of individual vehicles and also aggregates how many vehicles pass over the tubes into daily counts. A street is selected for the speed/volume study by city staff or a resident. The street is analyzed for the best place to place the tubes; generally, mid-block locations away from intersections or other obvious impediments that aren’t representative of the streetscape are preferred. The tubes are nailed into the roadway by a trained technician. Precise, parallel placement of the tubes is critical to ensure accuracy. Vehicles travel over the tubes for the duration of the study. As vehicles travel over the tubes, blasts of air are sent to the receiver box and the data is stored in the box until the technician picks up the equipment. With a known distance between the parallel tubes, speeds are calculated by measuring the time difference between the front axle hitting the first and second tubes. After the field component is completed, the technician retrieves the equipment and compiles the data to send to staff. Staff receive the data, interpret the results, and communicate a summary to residents (often in the form of a Traffic Action Plan). 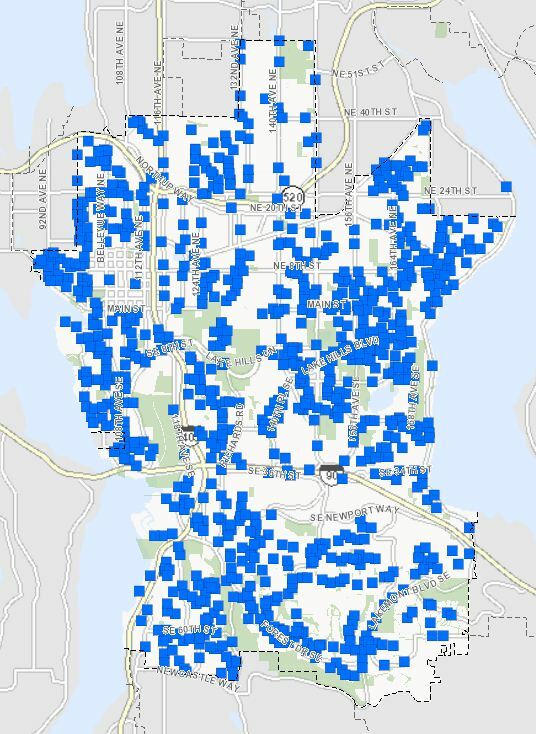 Each blue square represents the location of a where a neighborhood speed and/or volume study was conducted in Bellevue. We’re Ready for Winter Weather. Are You? Be sure to Take Winter by Storm this year. Stay in the know with closures, tips, and updates! Well, aside from some rain over the passes, we escaped the Thanksgiving holiday with minimal travel disruptions. Calmness in November, however, does not indicate calmness for the rest of the winter months. In the coming months when you are out and about—whether it’s a quick trip to the store or up to the mountains—be prepared for winter weather anytime, anywhere. Last year, we posted some tips on how to best prepare for winter travel and what you should take with you when traveling. This year, we want to reinforce and remind you that traveling in snow/ice takes planning, awareness, and caution. Remember, the best way to traveling during winter conditions is to avoid travel altogether. Be sure to sign up for the City’s extreme weather response alerts. Each time this City webpage is updated, you will receive either an email or text alerting you to the change. This is the best way to see how the City plans to or is responding to extreme weather. If you must travel, check the snow response priority map to plan your route along roadways that are more likely to be freshly plowed and check the real-time traffic map to see how traffic is flowing throughout the city. If snow/ice hits, the city’s Twitter feeds will be pushing out information to our followers with road conditions, response efforts, and general updates (City, Transportation, Police, Fire, and Emergency Management). Check for school closures on SchoolReport.org. 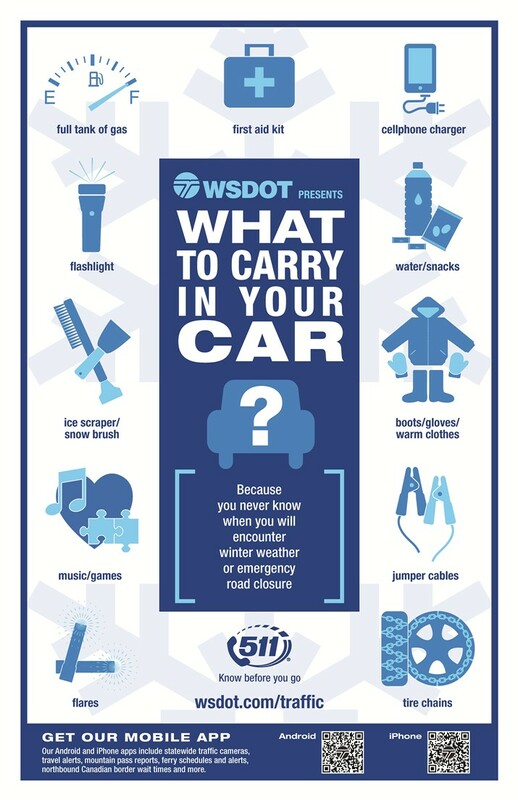 King County has great resources with tips on how to prepare for snow/ice and how to drive when the weather gets nasty. While avoiding travel is best, who can resist the call of fresh powder in the mountains? Fortunately, there are plenty of resources outside of Bellevue to help you get you where you need to be when conditions get dicey. If headed to the mountains, consult WSDOT’s pass report on Twitter (Snoqualmie, Stevens, Blewett, White). There, you can see whether there are travel restrictions, view real-time cameras, and check the mountain forecast). When traveling, you can always call WSDOT’s 511 to get location-specific updates on road conditions. This year, WSDOT introduced an easy-t0-read infographic reminding you what to have in the car when traveling during winter. Do your part and be prepared for whatever comes our way this winter. Regardless of whether you are traveling near or far, always be prepared for potenially hazardous conditions. Check conditions, keep informed, and stay safe. Chicanes–or slow points–are horizontal deflections designed to slow traffic speeds and can potentially discourage cut-through traffic. They interrupt a normally straight roadway forcing drivers to reduce their speed and navigate the chicane before continuing down the roadway. 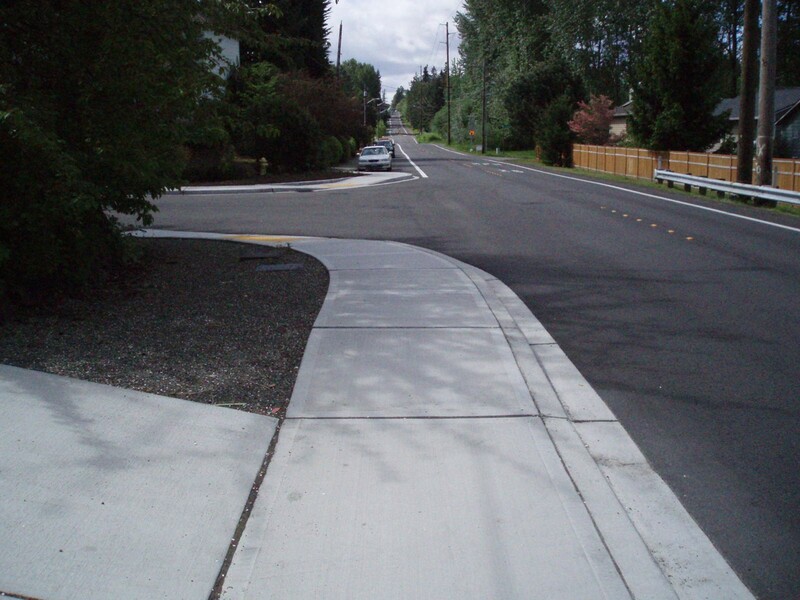 Chicanes are just one tool the City of Bellevue utilizes to address neighborhood traffic concerns. Still not sure what a chicane is? This animated video will paint a clearer picture. You might have noticed a chicane in the Wilburton neighborhood on the crest of 128th Ave NE just south of NE 5th St (below) or on NE 5th St between 120th Ave NE and 124th Ave NE. Neighborhood Traffic Safety Services is exploring installing a double chicane in the Enatai neighborhood along SE 8th St. Depending on their application, chicanes are either stop-controlled (like on NE 5th St) or simply instruct motorists to yield to oncoming traffic (like on 128th Ave NE). The roadways narrows allowing for only one motorist to pass through at a time. While it seems obvious that you simply drive through the delfection when you encounter a chicane, driving through when there are multiple vehicles waiting becomes trickier. Driving chicanes when there are muliples cars queing is like driving a one-way bridge: wait for all the opposing traffic to clear, then carefully proceed through the chicane. Once your vehicle and the motorists behind you are through the opposing traffic will pass and continue the cycle. Think parking is bad in Bellevue? It’s nothing compared to New York where chicanes naturally form when cars are double-parked.